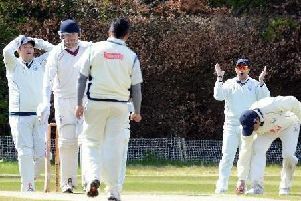 Uddingston Cricket Club stayed in title contention by beating Dumfries by 103 runs at Bothwell Castle Policies in the latest round of matches of the WDCU Premiership on Saturday. Winning the toss, captain Bryan Clarke decided to bat first and as usual Muhammad Awais and Sam Allan opened the batting. Allan was out first to Niall Alexander with the score on 20, which meant that Harmanjit Singh replaced him. Awais and Singh steadily built up the total to 72 before Awais fell to Jesse Smit’s bowling, caught by Chris McCutcheon. He was replaced by Jimmy Sholto-Douglas and they added 77 together for the third wicket before the latter fell for 29. At 149/3 after 35 overs, Uddingston then lost several quick wickets as the innings progressed, including Singh for 58 (off 112 balls), and it was left to Gavin Bradley to push the score on at the end of the innings. His 32 not out ensured that the Villagers would finish on 219/9 in their 50 overs. In reply, the Nunholm team started solidly with Andrew Dawson and Adam Malik. Together they put on 44 for the first wicket, though both would be bowled in quick succession by Gavin Bradley. Wickets then fell at regular intervals, as first Ross Lyons and then Awais took three wickets each in the innings, as well as Muhammad Adnan contributing a run out. At this point, Dumfries were 95/9. McCutcheon and Stuart Alexander continued to take the attack to Uddingston, the former hitting Singh for two successive sixes. However, when McCutcheon ran down the pitch to Awais, Alexander stood his ground and with both at the non-striker’s end, Bryan Clarke removed the bails to confirm the victory by 103 runs. Uddingston are third in the Premier Division table after an impressive three wins from their opening four matches this season. They also had two cup game wins this week (see Sports Digest).